The Nederlander Organization announced tickets are now on sale for RAIN - a tribute to the Beatles. The concert experience has been hailed "The next best thing to see The Beatles" by the Denver Post. "Uncanny! RAIN are a quartet of fine musicians in their own right...as the Beatles, they triumph!" cheers the Boston Herald. "An adoring Valentine to the Beatles," declares the Washington Post. 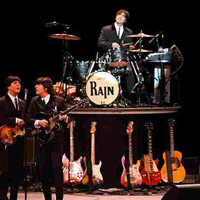 RAIN, the internationally-acclaimed Beatles concert, returns by popular demand to Hollywood's historic Pantages Theatre, where they enjoyed astounding success during their special one week engagement in 2009. Together longer than the Beatles themselves, RAIN has mastered every song, gesture and nuance of the legendary group, delivering a totally live, note-for-note performance. From the early hits to later classics that The Beatles never got the chance to play live, this multi-media concert recaptures the era through all phases of the Beatles' astounding musical career. They look like them and sound like them. RAIN covers the Fab Four from their very first Ed Sullivan Show appearance through the Abbey Road album, the psychedelic late 60s and their long-haired hippie, hard-rocking rooftop days. For those longtime band members, the authenticity and quality of the music is, and always will be, first and foremost. All the music is performed lice, with no pre-recorded tapes or sequences. RAIN's intention was not just to cover Beatle songs, but to take it to a new level. To do songs that The Beatles never performed live, and do them note-for-note, just like the records. The performance schedule for RAIN - a tribute to the Beatles is Tuesday through Friday at 8pm, Saturday at 2pm & 8pm, and Sunday at 1pm & 6:30pm. Opening Night is Tuesday, April 5th, 2016 at 8pm. Tickets for RAIN are on sale now and are available for purchase at www.HollywoodPantages.com or www.Ticketmaster.com, by phone at 800-982-2787, and at the Hollywood Pantages Box Office (6233 Hollywood Boulevard). The box office opens daily at 10am except for Holidays. Ticket prices start at $29. Groups of 10 or more may purchase tickets by visiting www.PantagesGroups.com or by calling 866-755-3075.